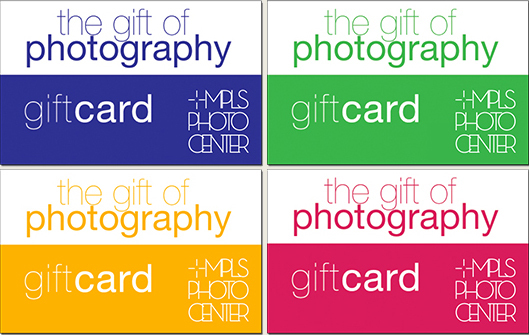 The Mpls Photo Center offers Gift Cards and Gift Memberships for the photographers in your life. Whether, spouse, partner, student or friend, the Gift of Photography is the perfect way to show you understand and support their passion. Gift Cards are available in any denomination of $25 and over and can be used for any of our great classes, printing, studio spaces and equipment. Gift Memberships are for one year and give the gift of being part of the vibrant photographic community the Mpls Photo Center nurtures. Members get discounts on education as well as access to all the facilities the Mpls Photo Center has to offer. Follow the links below to purchase. Whether you select a Gift Card or Gift Membership, you can include a personal message to the recipient with the card. MPC will process and mail all Gift Cards and Gift Memberships within 48 hours of purchase. For more information about the many ways the Gift Card or Gift Membership can benefit the photographer in your life, please contact us.